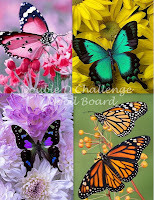 Summer brings wonderful days and beautiful butterflies! I love seeing colorful butterflies as they flutter on flowers in the garden. 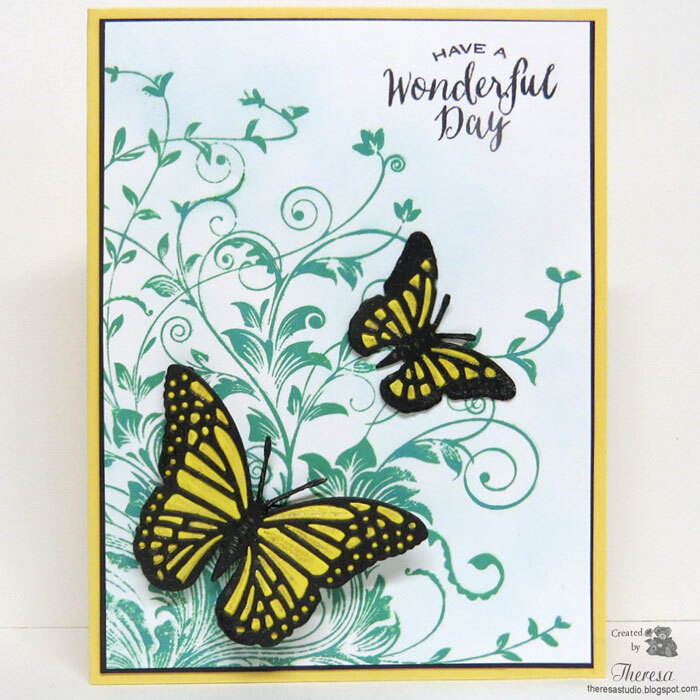 I tried to capture 2 of them on this card using Cheery Lynn Butterfly Dies with Yellow and Black card stocks. I arranged them on a background stamped with Hero Arts Leafy Vines stamp in Distress Oxide Ink and sponged with Memento Blue ink. Added some glitter with Stardust pen to the wings. 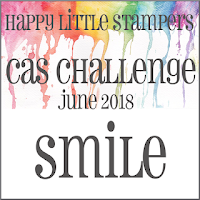 Used a sentiment from GKD stamped in black ink. Finished with a Yellow card base and a mat of Black CS. Welcome! This card was a result of my searching my digital images for a bicycle when I found this fun image from Beccy's Place of a lady riding a bike called Nell On A Bike that I had forgot that I had in my files. 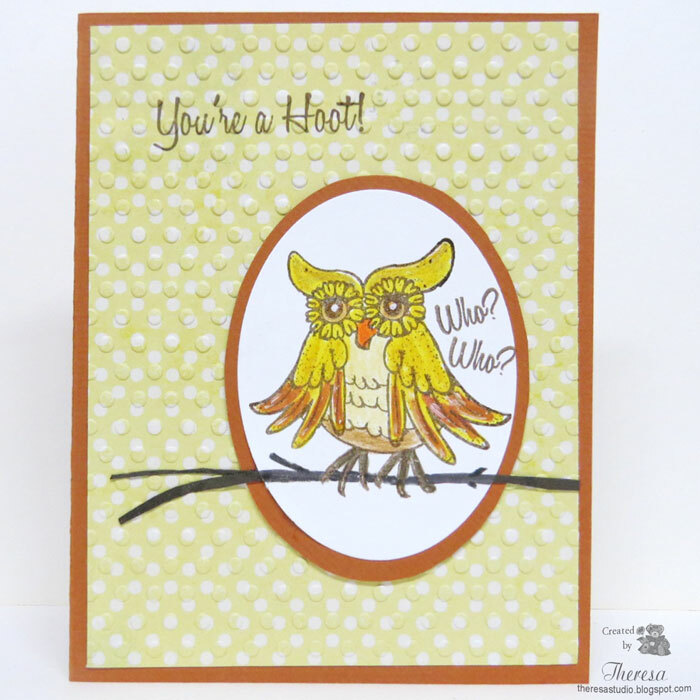 I printed off the precolored version of the image and made the card using a Sketch from Beccy's June Challenge. Supplies: White CS, Blue CS, Red patterned paper from stash, die cut flowers from stash, Papers and Such Stamp, Memento Red Ink, Embossing Folders, Oval Die. This was a fun card....she is such a fun character. 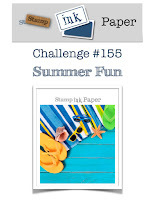 The Paper Girls: Challenges #154 Bicycles. 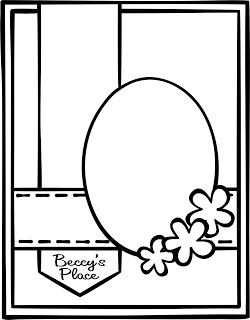 Beccy's Place: June challenge-Create a card or paper-craft project using any Beccy's Place image. 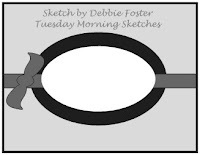 Option is to use sketch shown below. Hello! This is a card that I made a few days ago but forgot to post. 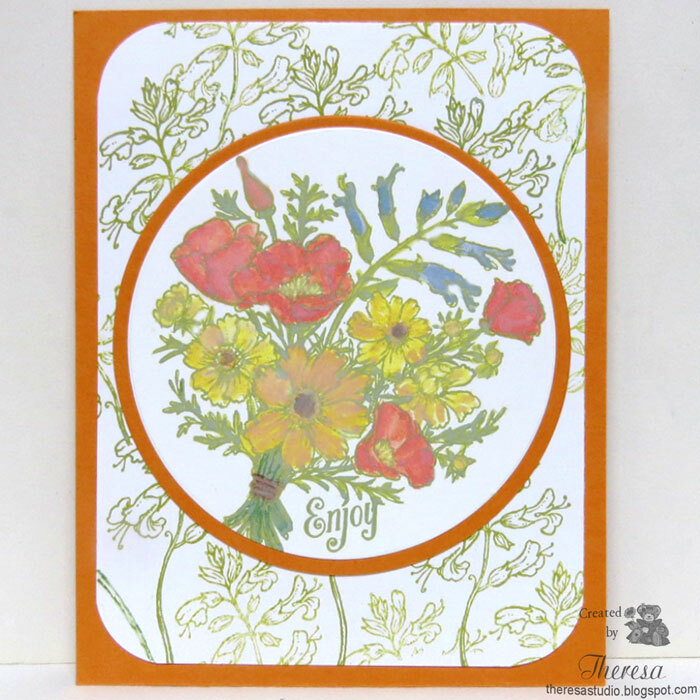 I used stamps from Power Poppy Countryside Bouquet for the background and the main image. The bouquet was water colored with Distress Oxide inks and a water brush. 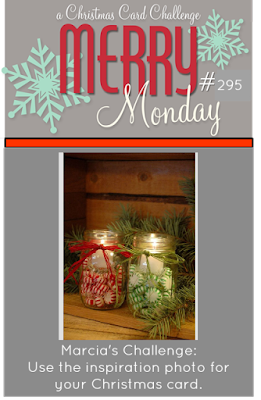 Other supplies: Circle dies, corner punch, Orange CS, White CS. 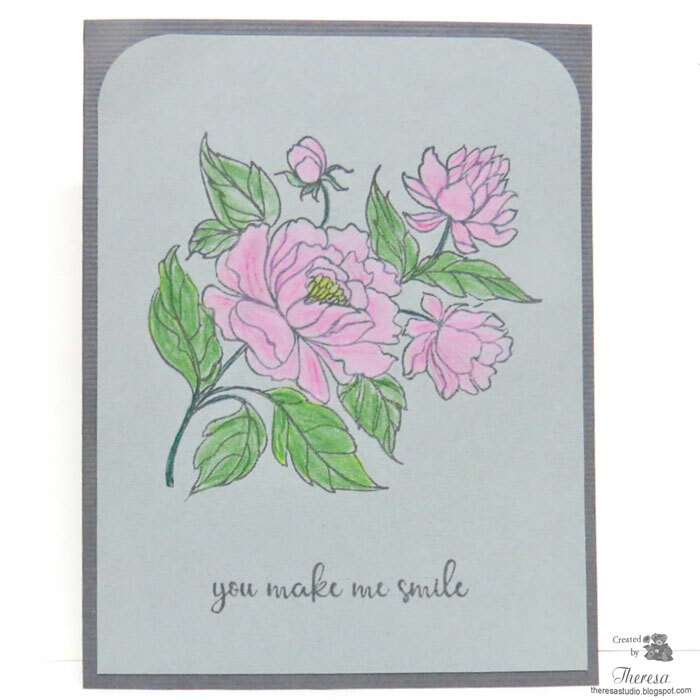 This stamp reminds me of the bouquets of summer flowers that I enjoy from my garden. 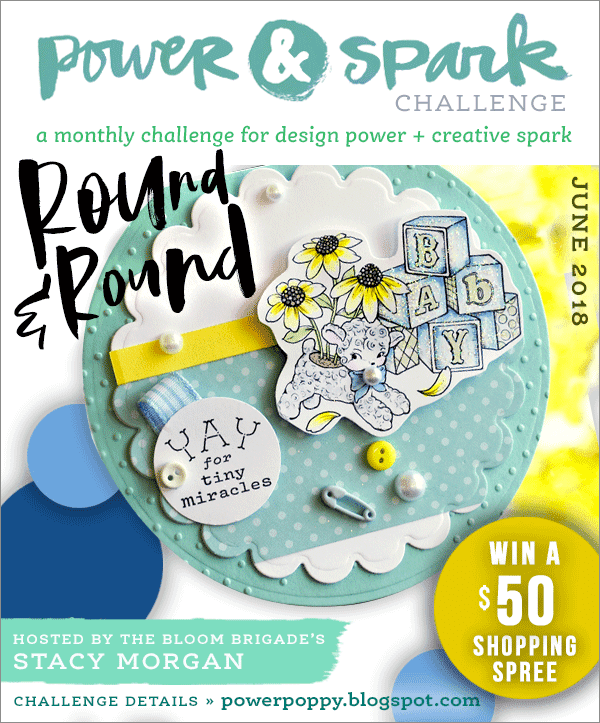 Power & Spark Challenge: Go Round and Round. Round those corners, use a rounded mat or make your entire card round. Hello! 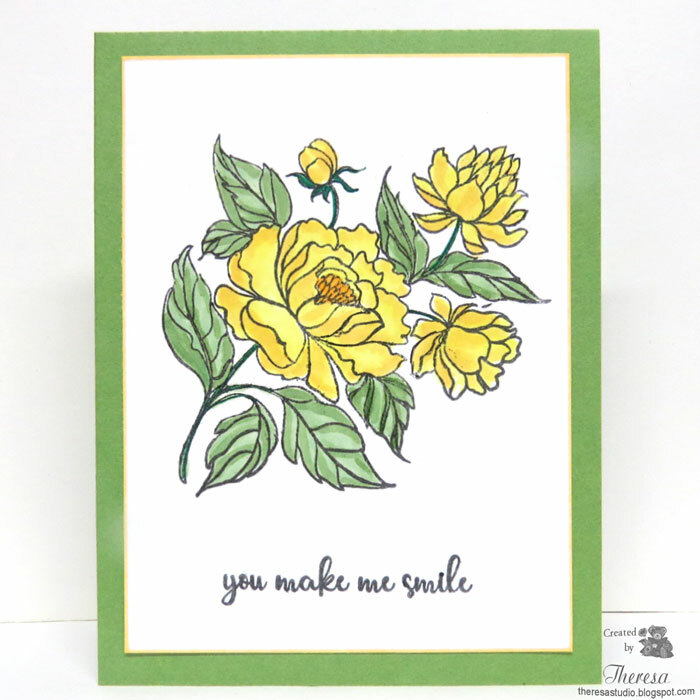 Today I have 3 cards to share that I made using the same Gina K stamp set called You Make Me Smile but used different techniques for each card. The top card was stamped on GKD Moonlit Fog CS with GKD new Amalgam Ink that works perfectly with Copic Markers, Watercolors and Colored Pencils, I used Pencils to color the image and simply attached to a darker gray card base. For the second card, I stamped with the same Amalgam ink on White CS but colored the image with Copics which I favor when coloring flowers. 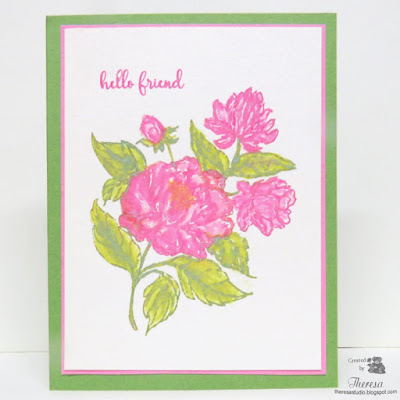 I decided to use watercolor paper and Distress Oxide inks for the third card. I stamped and water colored the image with Picked Raspberry and Peeled Paint inks using a water brush. 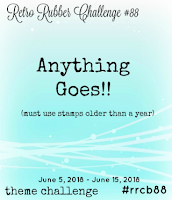 I had fun playing with new ink and stamps from Gina K that were a birthday gift from my DH. 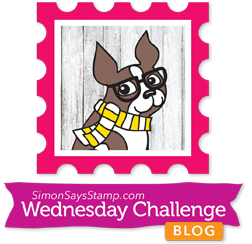 Simon Wednesday Challenge: Simon Says Bright and Cheerful. 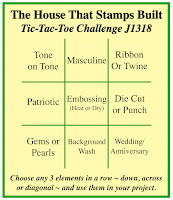 The second and third cards fits this challenge. 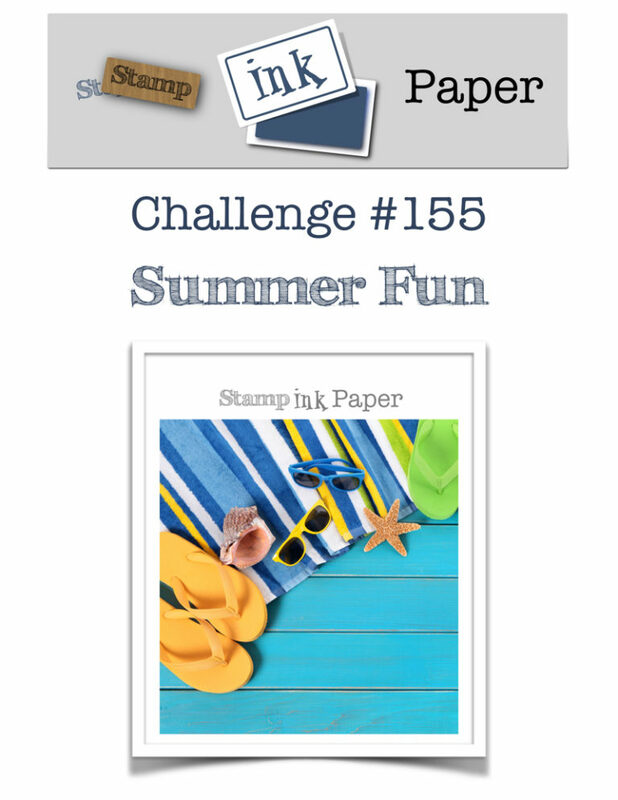 Addicted to Stamps and More: #297 Make Your Mark. Made my Mark with Pencils, Copics, and Watercoloring. 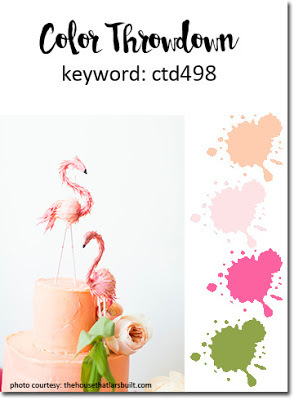 Color Throwdown: #498 Use Peach, Dark Pink, Light Pink. Green. 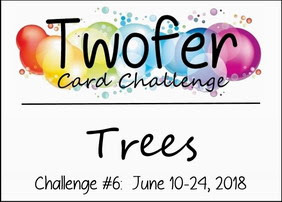 The third card uses all the colors of the challenge. 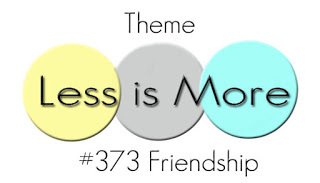 Less Is More: Challenge 373 Friendship. Used a single image for clean and simple card. Hello! Happy Father's Day to all the Dads out there. Sharing a card today that I made for the father of all my Bears. I recently purchased this digital stamp Just One More from the Busy Bears series at Lili of the Valley. 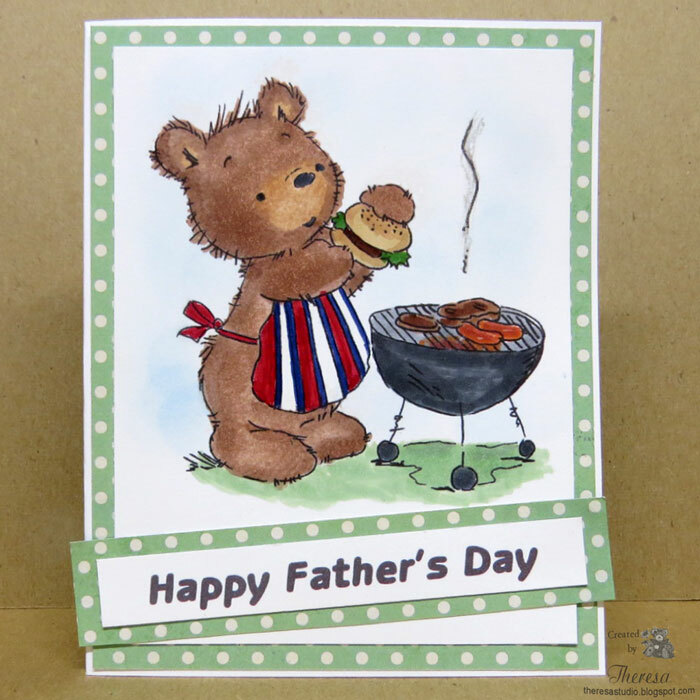 It was perfect for a card for my Grill Master DH. After printing the image, I colored him with Copics and used a mat of Polka Dot patterned paper. I printed the sentiment with the computer and attached to the card. 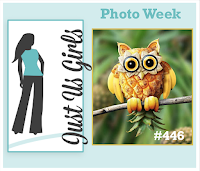 Cards In Envy: Let's Hear It For The Boys Card Challenge. Card fits into an envelope. 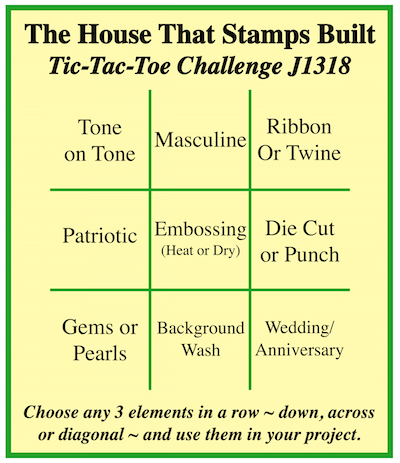 Stinkin' Inkers Challenge: The Guys have it...make a card for the special man in your life. Welcome! 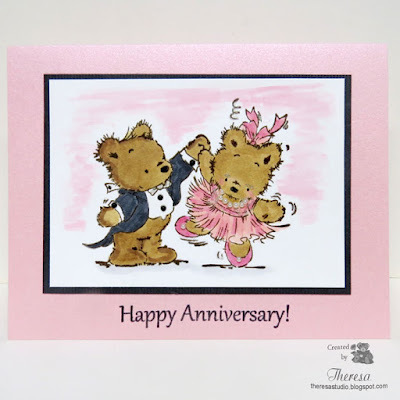 Some stamps just make me smile, like this one - dancing bears from Lili of The Valley called Shall We Dance which I have had over 5 years. 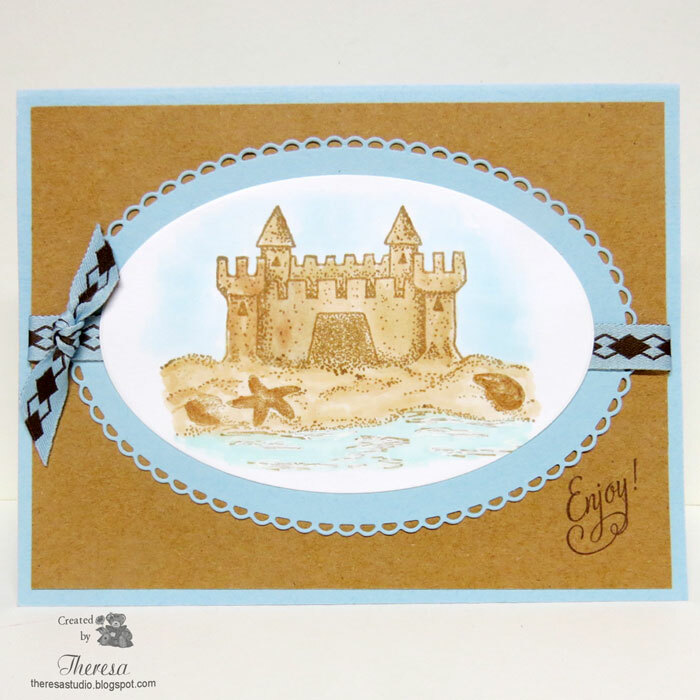 I stamped the image with Memento Rich Cocoa ink on GKD white CS and colored with copics. I had fun accessorizing their fancy outfits with Black Gemstones(cufflinks and buttons) and Pearls (necklace and shoes). I did a color wash in the background with Distress Oxide Ink and a water brush. 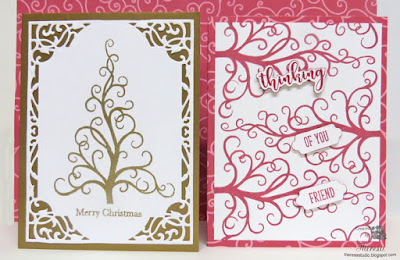 After trimming the image, I adhered it to a mat of dark gray CS and then to a base card of shimmering pink pearl CS. The GKD sentiment was stamped with black ink and embossed with clear EP. I will stash this card away for our anniversary in October. 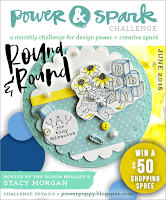 ModSquad Challenge: Wedding Bears in June-The challenge this week is to make a Wedding or a LOVE themed card. 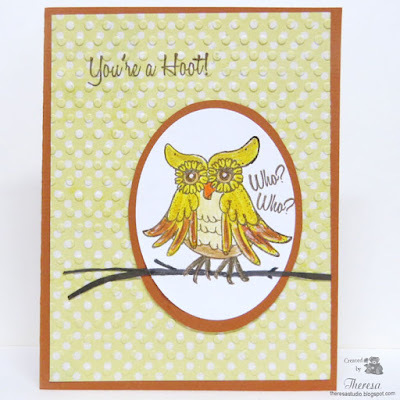 Must use a critter somewhere on the card. 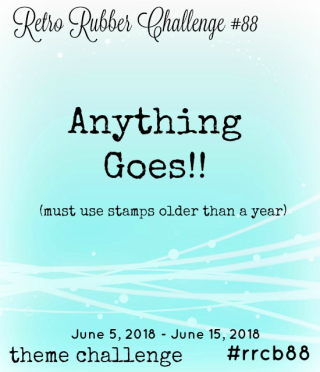 Retro Rubber Challenge: #88 Anything Goes. I used the LOTV stamp that I have had since 2013. I do not have a card to post so I am sharing more garden pictures taken early this June. Al made this photo of the front area of the house. Al shot this view of the climbing Pink Rose bush in full boom. 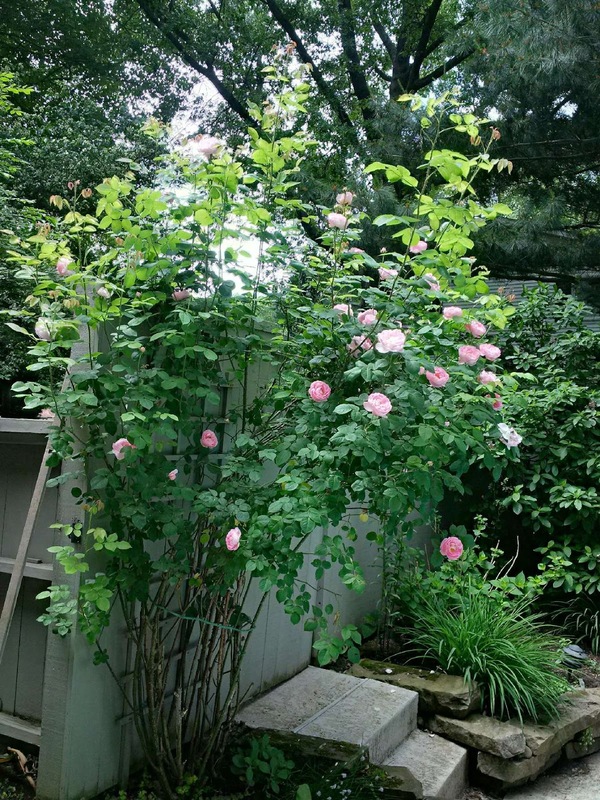 Th bush was a birthday gift from Al several years ago. We had a maple tree cut in this area this spring and are using the high stump as a bird bath. 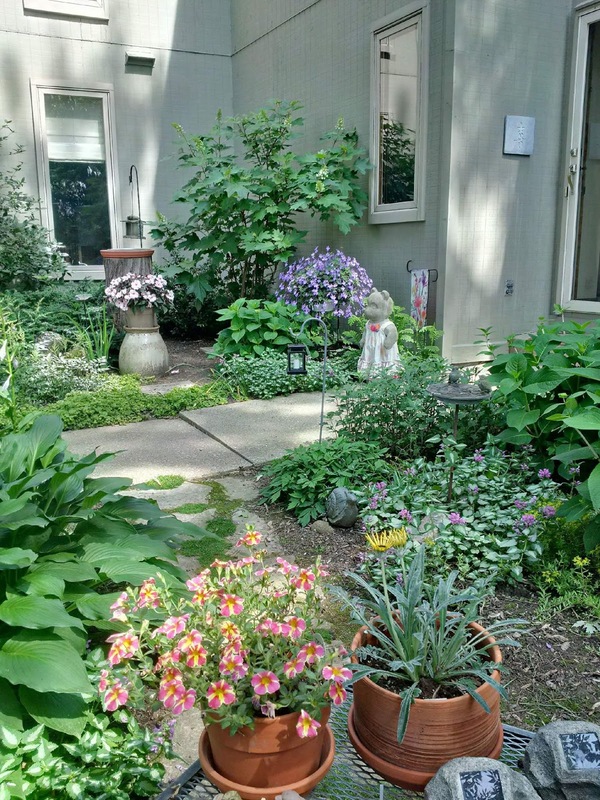 Our bench garden ….Al's favorite place to sit. Relocated a bird bath in our lower garden to an area which used to have a tree. Hello! I am enjoying my flowers from our garden (see below) but also enjoy stamping flowers on a card. 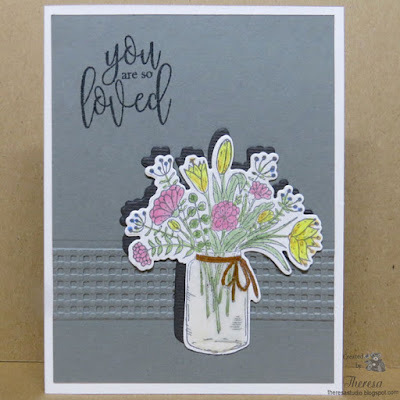 This card was made for Stamp TV's Monthly Mix Challenge Gray is the New Black. 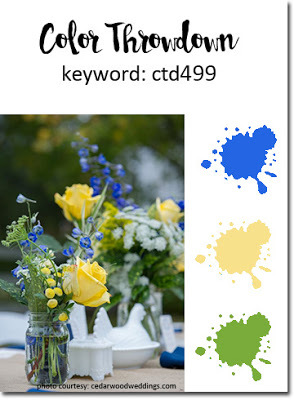 We are to use gray as one of the main colors not just as an accent color. 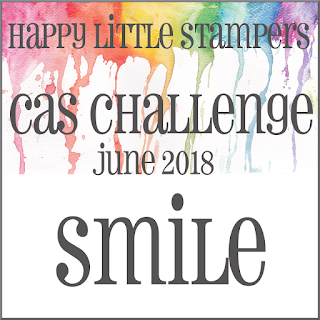 I used Gray CS as my background, Memento Gray Flannel ink for the sentiment and stamping the image, and a dark gray CS for the die cut behind my colored image. Supplies used: GKD stamps and die from You Have My Heart set, Clear EP, Glossy Accents, Copics, Wicker Weave border embossing folder, GKD Moonlight Fog and White CS's. No black used in the making of this card, just gray. Hello! 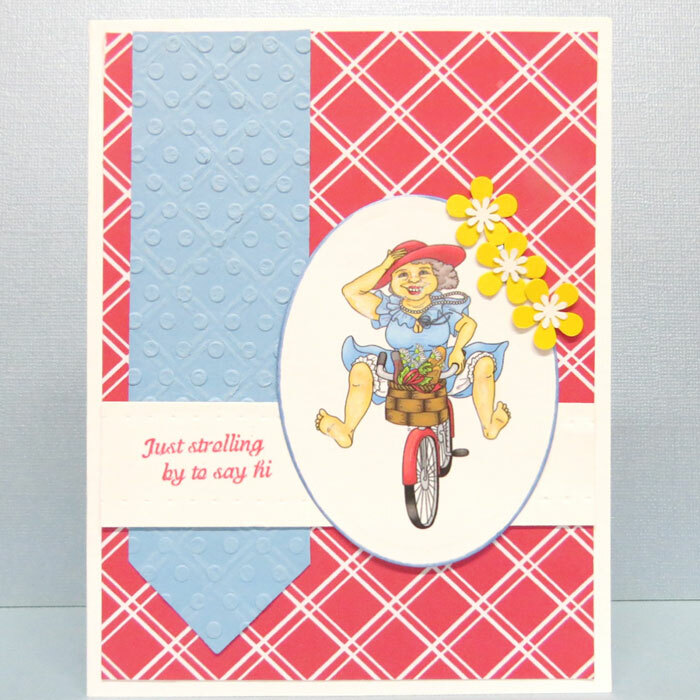 It's raining here today so I spent some time in my studio creating some cards. 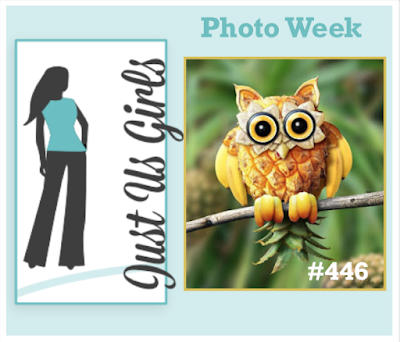 This one was made for the Come to the Dark Side challenge at Mod Squad. We are to color an image on dark colored card stock. 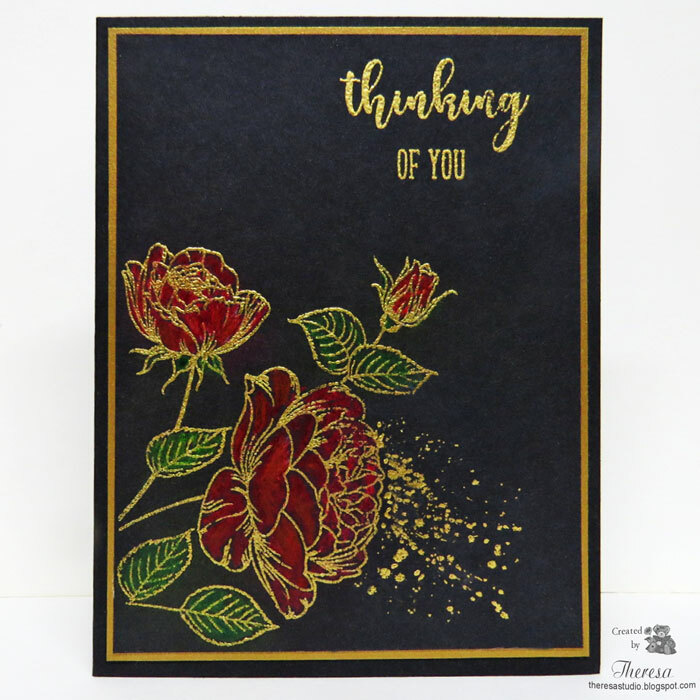 I stamped an image from GKD Tropical Blooms set on GKD Black CS with Versamark and heat embossed with Gold EP. I colored the image with Koh-I-Noor pencils. 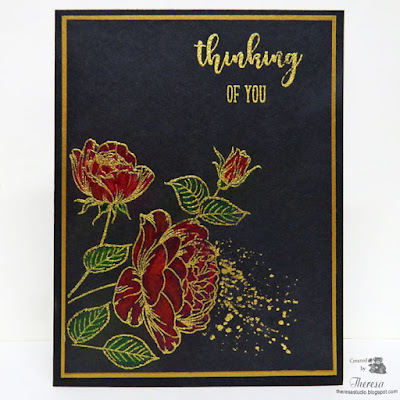 I also stamped the sentiment from the same set and stamped some splatter from GKD Tiny Textures with Versamark Ink and also heat embossed with Gold EP. I attached the image to a mat of GKD Gold Metallic CS and then to a base card of black. I thought this resulted in a very dramatic look.